Here at Giant Freakin’ Robot, we tend to get our information about AMC’s The Walking Dead like everybody else, through interviews and reports released by the show’s cast and crew. But now it’s possible to learn about the show in a completely different context: a college course. AMC is working with the massive open online course (MOOC) platform Instructure to bring “Society, Science, Survival: Lessons from AMC’s The Walking Dead” to students everywhere, or at least everywhere with an Internet connection. As if using pop culture to gain an education isn’t enough, the course is completely free of charge for anyone interested in taking it. Of course, this open invitation is balanced by students not actually receiving any certificate of completion for the class, but you can make your own, and bloody it up in the process. “A lot of what is going on with MOOCs is too specialized, or not pressing boundaries enough,” says Instructure co-founder Brian Whitmer. “So we came up with the idea of a pop-culture MOOC.” Okay, so admittedly, this is less a formal education tactic and more of a promotional tool for AMC, who hopes to capitalize on the popularity of MOOCs. Even a small percentage of the 12.4 million people who watched the third season’s finale would qualify as a success. But that doesn’t mean the courses are being taught by any regular Joe off of the zombie-ridden street. This powerful new deleted scene from the past season of The Walking Dead was just released. 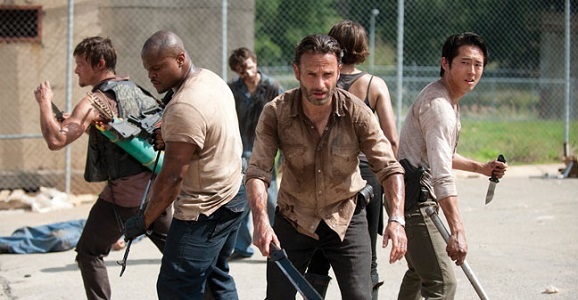 Cut from the “Clear,” this episode finds Rick (Andrew Lincoln) and Carl (Chandler Riggs) traveling back to their home in King County, Georgia, with Michonne (Danai Gurira) in tow. On a mission to find more weapons to protect themselves from The Governor (David Morrissey), the group comes across an obstacle course full of booby traps and other crude, hand-made weapons. Eventually meet up with Morgan Jones (Lennie James), the man who saved Rick at the beginning of the series. Over time he’s become a mad man setting up his last stand against the walkers. Since he last saw Rick, Morgan’s son Duane died and turned into a walker like his mother. The implication is that that Morgan had to kill Duane, and it also hinted at that he had killed other living people that crossed his path. Rick feels a sense of guilt because he was supposed to come back for father and son, but instead got caught up being reunited with his wife and son, and joining a new group of people. This new scene is pretty great, and James gives an absolutely phenomenal performance as Morgan Jones. All Lincoln has to do is sit there and re-act. The summer moviegoing season is finally winding to a close, with some unexpected victors (http://www.giantfreakinrobot.com/topic/world-war-z), some awesome surprises (Europa Report), and some big fat duds (R.I.P.D: Budget estimated at $130 million, worldwide gross of $59 million). Now it’s time to look forward to fall. For the movies, that mainly means Oscar bait and interesting smaller films; on the TV front it means new shows. Some will succeed, some will fail…and we hope at least one of them will actually be good. Here’s what to look forward to in the final months of 2013! After Chronicles of Riddick bombed at the box office in 2004 — it took in $92 million worldwide, against a $105 million budget — it looked like the adventures of the anti-heroic Richard B. Riddick were done on the big screen. Instead, director David Twohy and star Vin Diesel have resurrected the franchise pretty much through sheer force of will (and the leveraging of Diesel’s house). 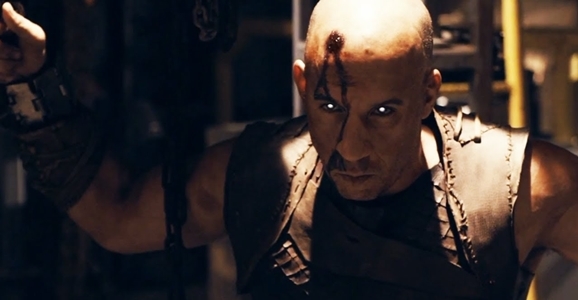 Riddick looks to be a return to the formula that worked so well the first time: Riddick being a badass and killing things in the dark. Twohy and Diesel obviously still have big plans for the character, so here’s hoping if we get a fourth one, it finds a way to mix the best elements of Chronicles and Pitch Black. This may very well be the make or break season for me and AMC’s The Walking Dead. I love the comics, and episodes like “Clear” from last season illustrate just how good the show can be. But on the other side, the quality varies so greatly week to week that it’s insanely frustrating as a fan to walk into each episode not knowing if you’re going to get quality or garbage. For every “Clear” there is at least one abysmal pile of nothing but filler, like “Arrow on the Doorpost.” There is some hope, however. When season four debuts on Sunday, October 13, it will be under the guidance of new showrunner Scott M. Gimple. He is the writer responsible for arguably the two best episodes since the series premiere in 2010, “Clear” and “Pretty Much Dead Already,” and if there is anyone who can right the ship, it’s him. He’s certainly saying all of the right things, and the cast and crew recently spoke with the Hollywood Reporter, offering up absurd amounts of information about the upcoming season, and most of the news shows promise. 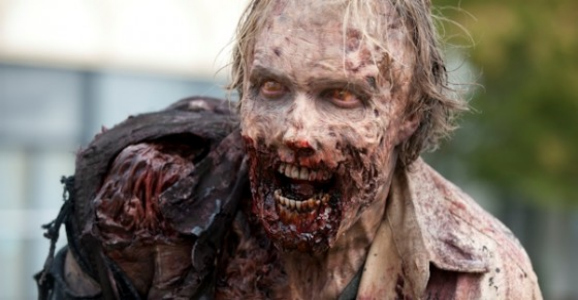 Sometimes it feels like we’re not going to get a look longer than a few measly seconds at the upcoming season four of AMC’s hit zombie drama The Walking Dead. Sure we got that extended preview coming out of San Diego Comic-Con last month, but since then it’s been a few seconds here, a few seconds there, and the latest clip, clocking in at a massive eleven seconds, continues this trend. Calling this eleven seconds of footage is, admittedly, a bit of an overstatement. The entire video is eleven seconds long, and that includes multiple network logos and a quote from some media outlet you’ve never heard of. In reality, you clock four to five seconds of actual footage from The Walking Dead. But it’s not a bad four or five seconds, and is pretty damn exciting for such a quick hit. Still, as full of madness, horror, and action as it is, such a short clip isn’t going to provide much in the way of satisfaction. There is a significant lapse in time between where season three of AMC’s zombie drama The Walking Dead ends and where season four picks up. The gap isn’t a large as between seasons two and three, but it’s big enough to be significant and allow for some major changes. The premiere episode is called “30 Days Without an Accident,” so we’re most likely talking about at least a month or more, enough time go do some serious home renovations. You can see these for yourself as comic book creator and executive producer Robert Kirkman gives you a guided tour through the altered prison set. At the end of season three, the gates had been breached, walkers kept getting into the prison, and is just wasn’t very secure. This is a problem when trying to survive a zombie apocalypse, especially if you just had a bunch of new people move in, as they did in the season finale, “Welcome to the Tombs.” Over the intervening days, weeks, and perhaps months, the team has certainly been busy, as you can see from the new set. Not only did they shore up their perimeter, lessening the likelihood that their border will be breached, but they’ve added a number of nice touches, from both a practical standpoint as well as where comfort is concerned. There are stashes of useful zombie killing implements placed around the prison yard and along the fences, in places where they’re most likely to come in handy. The outer fence is lined with items like knives, clubs, and other stabby devices, should you need to poke a zombie in the brainpan.